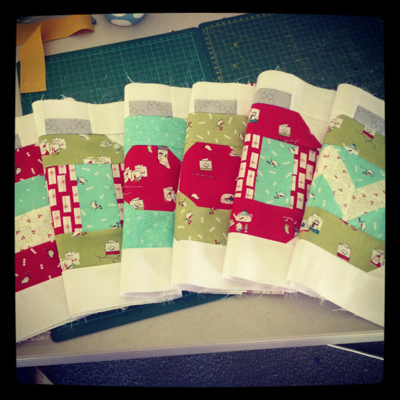 I have been back working on my Christmas Table Runners. The first one I quilted "in the ditch". and try some FMQ with some new settings that I have for my machine. I did it and at last have the right settings for my machine. It has only taken me 12+ months! As you can see on the top one, the binding was almost completed. and play with some more FMQ. All four table runners are quilted and I am slowly working on hand stitching the binding. I am looking forward to sharing them with you very soon. Oh, these are very pretty! You did a wonderful job of the FMQ! There will be no stopping you now! Wow Sharon, your table runners are beautiful. 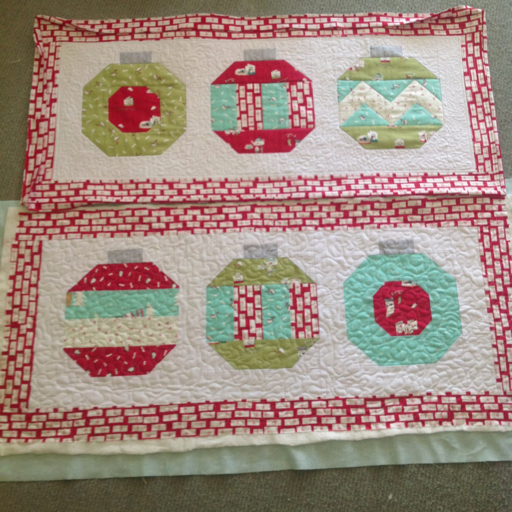 I love the colours and the fabrics, well done on your quilting, I think you did a great job. Beautiful table runners Sharon,lucky recipients. Which fabbric range have you used for them? :) Barb. These are really lovely, the have chosen such gorgeous fabrics. 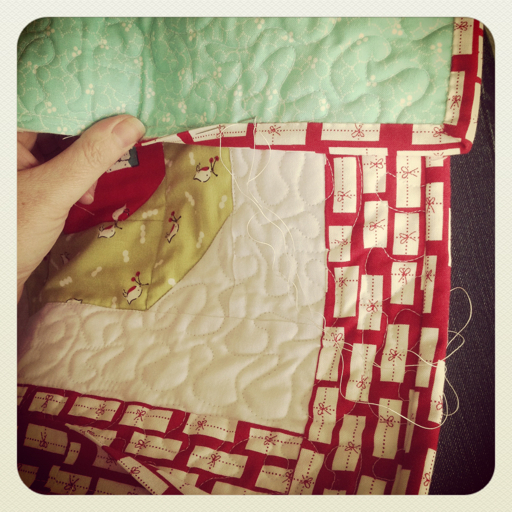 Your quilting looks great, and so handy to be able to do it yourself. Those runners will be such great gifts. Sharon, your runners are beyond adorable. Thank you so much for sharing. So lovely Sharon. I am still too whimpy to try Fmq. 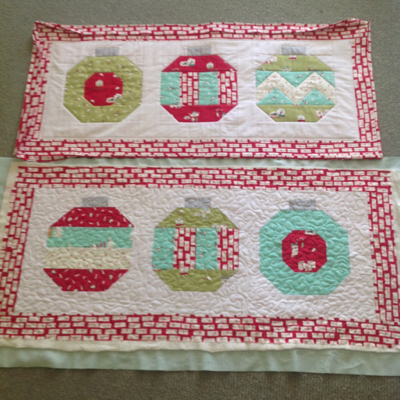 What a difference some quilting can make. Your table runners are wonderful and so is your quilting... great job! Your quilting looks great Sharon. I really must give that a try! They're gorgeous Sharon!!! 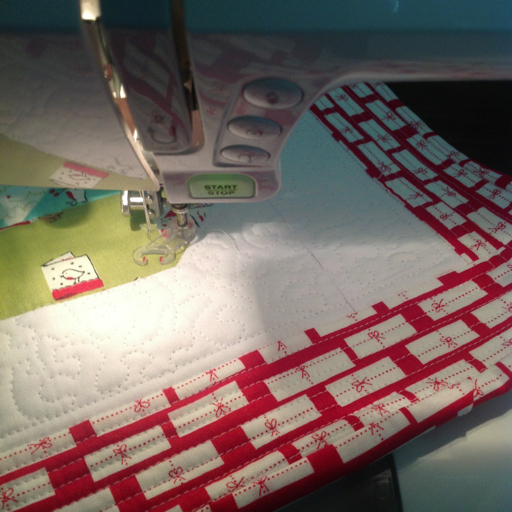 Your quilting looks fantastic - perfect choice of design too!! Great job of the FMQ and all your tab;e runners look great. You are good doing the binding by hand. I machine stitched my..